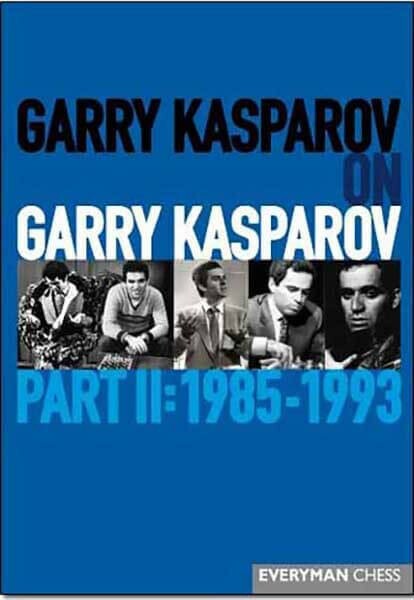 Garry Kasparov on Garry Kasparov: Part II is the second volume in a major three-volume series made unique by the fact that it records the greatest chess battles played by the greatest chess player of all-time. Kasparov’s series of historical volumes have received great critical and public acclaim for their rigorous analysis and comprehensive detail regarding the developments in chess that occurred both on and off the board. Part I of this series saw Kasparov emerging as a huge talent and eventually toppling his great rival Anatoly Karpov to gain the world title. This volume focuses on the period from 1985-1993 which witnessed three title defences against Karpov as well as a number of shorter matches against elite players including Hübner, Anderssen, Timman and Miles. This period also saw Kasparov achieve spectacular results in both individual and team events. Kasparov won the board gold medal in three Olympiads (Dubai 1986, Thessaloniki 1988 and Manila 1992). The late 1980s also saw the emergence of the World Cup series which Kasparov utterly dominated, finishing either clear first or equal first at Belfort 1988 (11½/15), Reykjavik 1988 (11/17), Barcelona 1989 (11/16) and Skelleftea 1989 (9½/15). Other major tournament victories include Brussels 1987 (8½/11), Amsterdam 1988 (9/12), Tilburg 1989 (12/14), Belgrade 1989 (9½/11) and Linares 1990 (8/11). During the late 1980s and early 1990s Kasparov emphasized his huge superiority over his rivals. Despite generally adopting an uncompromising, double-edged attacking style he almost never lost. The games in this volume feature many masterpieces of controlled aggression played against the world’s absolute best.